Build an even better PC sound card based oscilloscope using my book: Sound Card Oscilloscope - Build Better Electronic Projects. 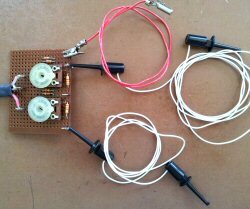 Everything is explained in great detail how to build the scope probe, a calibrator and a handy signal generator. I also show you how to build it all into small enclosures that fit nicely on your desk next to your PC. You should by now have all the components that you will need to complete the construction of your PC scope probe so lets start by preparing the board that you will build it on. 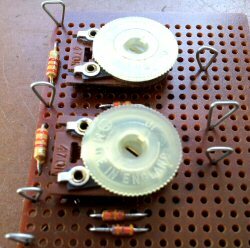 Then place your components on the board and route the leads on the underside. Finally, solder the connections and the input and output connections. When this is complete you will be ready to install the software on your PC and start using your oscilloscope. 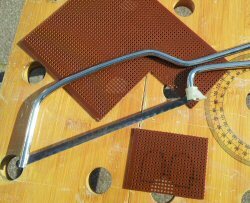 Use a small saw to cut your perforated board to size. Before you do this you should take your components and lay them onto the board in the positions you want them and then mark out the edges of the board allowing enough space for all components and connections. My board measured approximately 60mm (2.4inch) x 48mm (1.9inch). Remember it is better to overestimate the size you need rather than cut the board too small to fit the parts onto. Remind yourself of the circuit diagram. 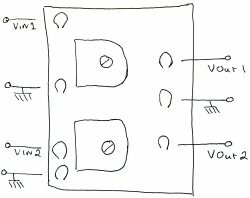 The circuit is simple and in two identical parts. 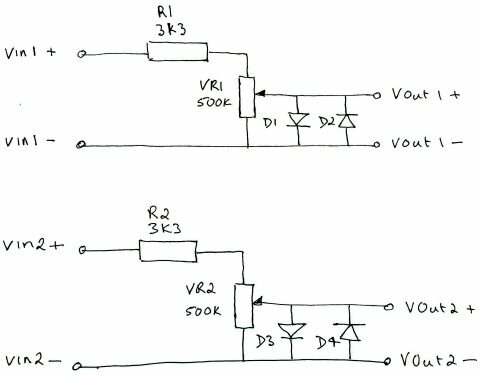 It will be helpful at this point to draw a sketch of what you want the final PC scope probe to look like with the input and output connections marked on it. This is the top side of my finished scope probe board. 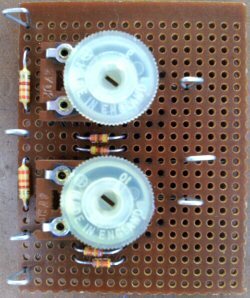 Note that each of the two pairs of diodes are connected top to toe in parallel. This is a slightly different view of the top side of my board showing how I mounted the home made connection posts. If you choose to use the alternative method of making the posts then be sure to allow extra room for the additional hole that each post will take up. If you can you should make all the connections on the underside of your board by wrapping the leads together. When you have finished carefully inspect the wiring and compare it against the circuit diagram. It is much easier to correct any errors at this stage before you solder all the connections. Before you start soldering please bear in mind that your components will get hot during this process and that electronic parts can be damaged by excessive heat. 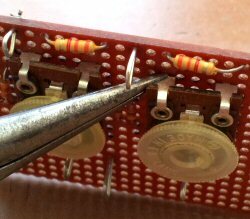 This is a general problem with building electronic projects so it's a good idea to try and minimize the time that you apply the hot soldering iron. 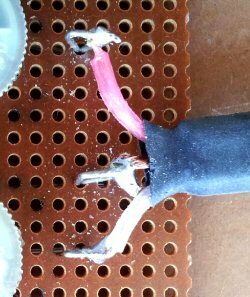 In some instances you can apply a heat sink to the component leads to conduct some of the heat away from the device. Semiconductor devices like transistors, diodes and integrated circuits are very susceptible to heat damage. I have a simple technique that works well for me. 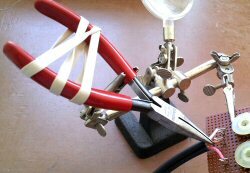 I use a pair of Long nose pliers to grip the component lead between the device and the point where you apply the heat. The problem with this is that you end up needing 3 hands to hold the pliers in place while you apply the solder. 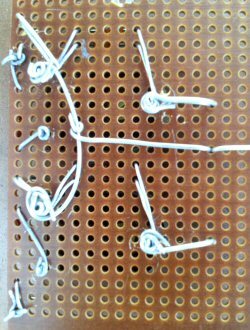 Placing a strong elastic band around the handle of the pliers should hold them clamped onto the lead long enough for you to solder it. Solder all the connections. 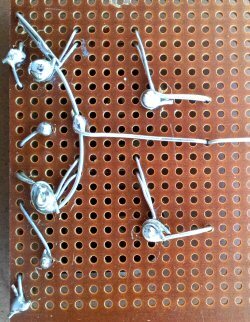 If you are not sure about how to solder then be sure to go through the soldering tutorial Soldering Is Easy before you start. Take your audio lead and cut off one of the 3.5mm jack plugs. Strip the wires slip a small length of heat shrink tubing on to keep the end tidy and connect the two inner cores to Vout1 and Vout2 and the outer braid of the wire to the common connection as shown. For your input connections you can either use crocodile clips or small probe clips. I like these small clips as they are easy to connect up and to use. It's best to use flexible wire for your probe cables. Push it through the hole in the clip, strip the insulation, solder the connection and snap the two halves of the clip back together. This is how my final PC scope probe looks. It's not very pretty but it works. On the next page I show you how to get the software up and running with your probe.